Federally funded by the U.S. Department of Education, TRIO programs provide services and resources to promote access to higher education. The annual ASPIRE awards recognize former TRIO participants who have become leaders in their professions. Mullendore grew up on a homestead near Jackson, Wyoming, where he was taught the value of hard work. While pursuing his bull riding dream, he began gardening during recovery from one of his many injuries. His interest in gardening led to a passion for plants which, in turn, led him complete his GED and enroll at the University of Wyoming to study botany in 2002. Support from his mentor at Wyoming, plant pathologist Stephen Herbert, was crucial to Mullendore’s success. Herbert recommended Mullendore apply to the McNair Scholars Program, which encourages undergraduate students from traditionally underrepresented groups to pursue graduate studies by providing opportunities to define goals, engage in research, and develop the skills and student/faculty mentor relationships. “The McNair Program was crucial for teaching me how to successfully apply for post-baccalaureate education,” Mullendore says. “They provided the funds necessary for me to stay through the summer to do research. This was the first time that I could stay for the summer and not have to return to my seasonal construction job. It didn’t just open doors for me; the program revealed doors that were invisible to me as a first-generation student,” said Mullendore. He completed his doctoral program in botany at Washington State University in 2012. Since then, he has published nine original research papers and one book chapter, and twice traveled to the Netherlands to use the only MRI machine in the world able to measure sugar flow in plants. His duties at the Franceschi Center include guiding students and faculty in advanced microscopy techniques and experiment design and execution. For the past year, he has also served as an instructor for the Special Topics in Electron Microscopy course. “This teaching opportunity has allowed me to mentor students from diverse backgrounds. I often use what I learned through the McNair Program to help these students pursue their professional careers,” Mullendore says. 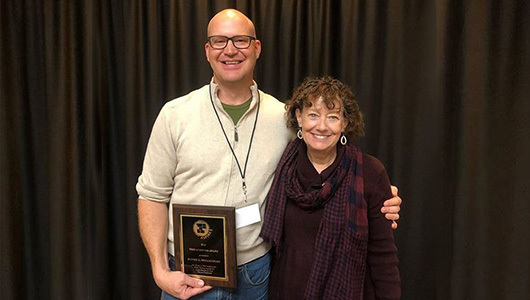 Top photo: Mullendore, left, with his nominator, Susan Stoddard, director of the McNair Scholars Program at the University of Wyoming. Originally posted by the School of Biological Sciences and ASPIRE.